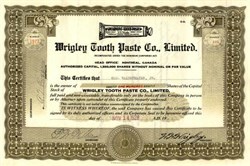 Beautifully engraved Scarce certificate from the Wrigley Tooth Paste Company, Limited issued no later than 1929. This historic document was printed by the British American Bank Note Company and has an ornate border around it with a vignette of a tube of tooth paste. This item is hand signed by the Company's President and Secretary and is over 85 years old. This company made toothpaste and other related pharmaceutical products. W.W. Wrigley capitalized on the Wrigley Chewing Gum name with his Spearmint toothpaste. As it turns out, W.W. Wrigley was the cousin of the Wrigley who made the chewing gum. The Wrigley Pharmaceutical Company closed its operations in 1941 due to the declining health of W.W. Wrigley. The company was called Wrigley Pharmaceutical Company in the United States. We have only seen a few of the Canadian Certificates from this company.